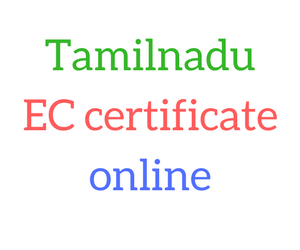 Government of Tamilnadu has providing EC (Encumbrance Cerficate) online. Previously encumbrance certificate takes time, as the entries are searched manually before 1987. From 1987 onwards the indexes are computerised and the encumbrance certificates are issued on the spot. Special counters have been opened to receive applications and certificates are issued on demand without delay. Applications for Encumbrance Certificate can be submitted through Online Application Form through official website http://www.tnreginet.net and the Encumbrance Certificate will be delivered at your door step. What is an EC ( Encumbrance Certificate ) ? The Encumbrance Certificate is used in property transactions as an evidence of free title/Ownership. At the time of selling your property or buying a new property you need to check the track of the property and verify the genuineness of your seller. Government registry enters all these details in the registrar of books. this is called encumbrance Certificate. How to apply Tamilnadu EC ( Encumbrance Certificate ) online ? 1. Applicant Just logon to Registration Department website. 3. Now you'll see Registration form for apply EC online, Fill the all necessary details in the registration form. 4. Than Click on "Submit Button"
5. finally Save/ Print your Acknowledgement slip. How to Check Tamilnadu EC Status online ? 1. Just logon to Registration Department website. 2 .Click on " Online EC Status"
3. Now Enter your EC online Application Number. 4. Click on "Search" Button. 5. Finally Get Tamilnadu EC status online. How To View EC (Encumbrance Certificate ) online ? 5. Click on "Search " Button. 6. Finally Get Tamilnadu EC details online.